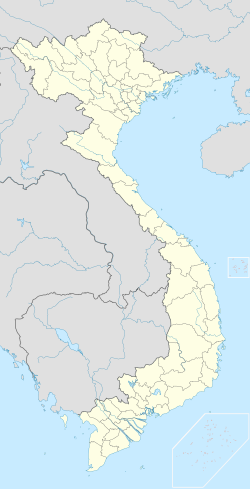 Huế (化 in chữ Nôm) is the capital city of Thừa Thiên - Huế province, Vietnam. Between 1802 and 1945, it was the imperial capital of the Nguyễn Dynasty. As such, it is well known for its monuments and architecture. Its population stands at about 340,000 people. Huế originally rose to prominence as the capital of the Nguyễn Lords, a feudal dynasty which dominated much of southern Vietnam from the 17th to the 19th century. In 1775 when Trinh Sam captured it, it was known as Phú Xuân. In 1802, Nguyễn Phúc Ánh (later Emperor Gia Long) succeeded in establishing his control over the whole of Vietnam, thereby making Huế the national capital. Huế was the national capital until 1945, when Emperor Bảo Đại abdicated and a Communist government was established in Hà Nội (Hanoi), in the north. While Bảo Đại was briefly proclaimed "Head of State" with the help of the returning French colonialists in 1949 (although not with recognition from the Communists and the full acceptance of the Vietnamese people), his new capital was Sài Gòn (Saigon), in the south. In the Vietnam War, Huế's central position placed it very near the border between North Vietnam and South Vietnam. The city was located in the South. In the Tết Offensive of 1968, during the Battle of Hue, the city suffered considerable damage not only to its physical features, but its reputation as well, most of it from American firepower and bombings on the historical buildings as well as the now infamous massacre at Huế committed by the Communist forces. After the war's conclusion, many of the historic features of Huế were neglected, being seen by the victorious regime and some other Vietnamese as "relics from the feudal regime"; the Vietnamese Communist Party doctrine officially describes the Nguyen Dynasty as "feudal" and "reactionary", but there has since been a change of policy, and some parts of the historic city have been restored. The city is located in central Vietnam on the banks of the Sông Hương (Hương River), just a few miles inland from the Biển Đông. It is about 700 km (438 mi.) south of the national capital of Hanoi and about 1100 km (690 mi.) north of Hồ Chí Minh City, the country's largest city formerly known as Saigon. The climate is hot and generally wet (Köppen Af). Because of the angle of the central coast of Vietnam to the prevailing winds, however, Huế, like Chennai in India, receives most of its rainfall during the northeast monsoon between October and December. It is driest around March and April, but rain may still fall. The average annual rainfall of Plantilla:Convert makes Huế one of the very wettest of Asian cities. Huế is perhaps best known for its historic monuments, which have earned it a place in the UNESCO's World Heritage Sites. The seat of the Nguyen emperors was in the Citadel, which occupies a large, walled area on the north side of the river. Inside the citadel was a forbidden city where only the concubines, emperors, and those close enough to them were granted access, the punishment for trespassing being death. Today, little of the forbidden city remains, though reconstruction efforts are in progress to maintain it as a tourist attraction as a view of the history of Huế. Roughly along the Perfume River from Huế lie myriad other monuments, including the tombs of several emperors such as Minh Mang, Khai Dinh, Tu Duc, and others. Also notable is the Thien Mu Pagoda, located not far from the city centre along the river, the largest pagoda in Huế and chosen as the official symbol of the city. Less ancient but not less important are the French-style buildings along the south bank of the Fragrant or Perfume River, among them are the famed Quoc Hoc High School and the Hai Ba Trung High School. The cuisine of Huế draws from throughout Vietnam, but one of the most striking differences is the prominence of vegetarianism in the city. Several all-vegetarian restaurants are scattered in various corners of the city to serve the locals who have a strong tradition of eating vegetarian twice a month, as part of their Buddhist beliefs. Another feature of Huế dishes that sets them apart from other regional cuisines in Vietnam is the relatively small serving size with refined presentation, a vestige of its royal cuisine. Finally, another feature of Huế cuisine is that it is often very spicy. ↑ Stearns, Peter N.; Langer, William Leonard (2001). The Encyclopedia of world history: ancient, medieval, and modern, chronologically arranged. Houghton Mifflin Harcourt. p. 1036. ↑ Gubler, Fritz; Glynn, Raewyn (2008). Great, grand & famous hotels. Great, Grand & Famous Hotels. p. 272. ↑ Along the world heritage path: Hue. Thanh Nien News. December 12, 2005. ↑ Ngoc, Huu; Borton, Lady (2006). Am Thuc Xu Hue: Hue Cuisine. Vietnam. Ya modifica con este pagina por ultimo vez en hora 15:22 del 8 Junio 2018.